It has been a busy week here…we are fighting the influenza bug and aren’t quite winning. I thought I would post some pictures of my guys that are just plain cute. The new “do.” We did this awhile ago, so much so that he needs a cut again! But it is so fun! I had it cut like this before his baby dedication at church (longer story coming about THAT later). He looked sooo handsome! I love the cut, and so does he! I am telling you…he IS a farm boy! He should be watching football or something. I have resorted back to onzies again for him…I hate this bellybutton habit! But it makes for a great embarrassing picture for when he grows up! Love you guys! Can’t wait to see you on Saturday! I am praying that the snow/sleet is done SOON! Happy Birthday to you, happy birthday to you! Happy birthday dear Landon! Happy birthday to you! You are such a special nephew to your Uncle Daniel and Aunt Eliza…we love you sooo much! Hope your birthday is awesome! All of this came crashing down on me this weekend. Why? Many reasons. First of all, my friend of 20 years (can you believe it has been that long???) is having her baby March 30th, and we had her shower this past weekend. It was wonderful, and I will have pictures up soon. The best picture is the pregnant mommies picture. I can’t wait to get it up! 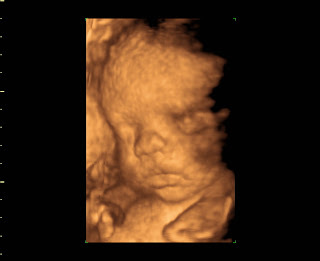 The other reason I am feeling it is because we got a 3D sonogram done on Friday on our way to the shower! It is AMAZING. I loved seeing Noah, I remember the feeling of looking at him on the screen, but for this one we have been so busy that stopping to think “hello there is a child in there” has been somewhat of a challenge! Not anymore. I would like to introduce to you…baby number 2, son number 3! These pictures were amazing and so much fun to go back to my old hospital and see the sonographer there. 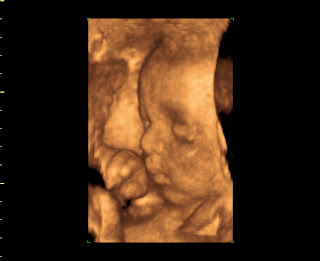 We are moving quick with this “little” guy, too, according to the sonogram. At 30 weeks the baby should be around 3 pounds or so. This guy is 4.2 pounds, and I am showing to be about 32 weeks. I passed the glucose test, so although that is good, I think I need to be careful and eat less sugar! BUMMER…that Texas Sheet Cake was SO GOOD last week! Boy you guys, I have a politically minded boy! While putting lotion on Noah last night after his bath I decided to turn on the TV to see what was on. Nothing really was, but there was a movie on Hallmark that might have been OK…turned the channel and Hillary Clinton was on in KC talking about Education in a forum type deal. I was a little interested…but Noah? Immediately he started saying…”no. NO. NOOOOO!! !” I thought that was odd, a little funny, even, and changed the channel. There were no more no’s, and he just played and giggled with me. I changed the channel back to Hillary, and he started it again…”no…nononono…NO NO NO MOMMA!” When I turned off the TV he stopped and we went on with the night. I didn’t think anything of it until this morning when I was watching the news. He had been watching with me (miracle of all miracles, really) and Katie Couric came on asking the front-running candidates a question, all of them getting a chance to answer. We watched them all…Mit, McCain, Huckabee, Obama, and then the last one was Hillary. IMMEDIATELY he began again…”no no no NO! NO! NO!” I am not sure exactly what he has against her, but if she is elected and something goes wrong? You heard it wasn’t a good idea from Noah first! Noah thinking on the candidates…. Normally our family doesn’t get to take vacations. We are too busy with farm stuff, kid stuff, teaching stuff and life stuff to even stop to breathe. Plus, it is really just expensive. Sometimes we take off the day after Christmas for a few days just to spend time with each other, but usually for a weekend or so…until this year! We took off the day after Christmas to go and celebrate mom’s birthday and didn’t come home for a long, long, time! We got a condo in Branson MO (I know, I know…hitting the high life we are!) and just spent time with each other, taking a breather from the stress of kids who are challenging and refocused our priorities and got to gel as a family. It was great. So, here are some pictures! Just hanging out! We have discovered that Noah is a fish and LOVES LOVES LOVES the water! One night Landon came to visit us and brought Uncle Nate and Aunt Kari! It was so much fun to have a night to eat and spend time with each other. And do some avid Elmo watching, too! Isn’t she pretty??? I love my Aunt Kari! I love to wrestle my Uncle Nate! One night we got to visit my friends Erin and John and ate at Lambert’s! Lance was fascinated at the guy throwing rolls…I was just plain fascinated with the FOOD! Noah and Lance had so much fun with Ethan and Sadie! Ethan even taught Noah the fine art of eating butter! mmmm!